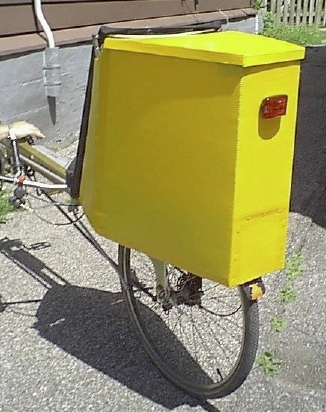 The Bike Gets a Trunk. 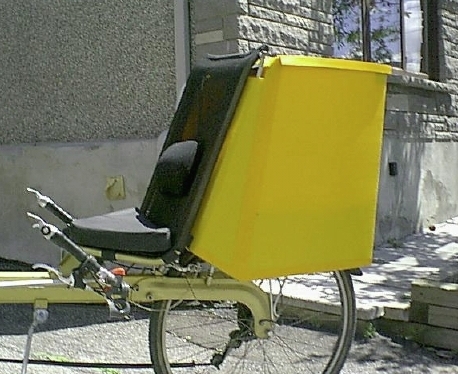 I got the idea for a tailbox from some creative folks on the various Internet recumbent email lists. 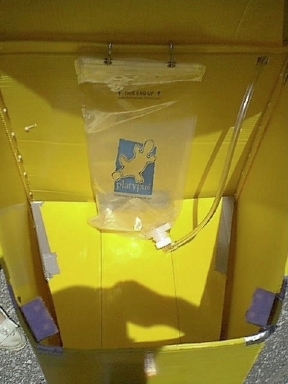 The tailbox serves many functions - it keeps things dry; my repair kit, pump, and hydration bag can stay with the bike (not carried around in my knapsack!) when parked; and it has a small aerodynamic benefit, or so I'm told. (When my cycle computer died, I didn't bother replacing it, so I can't make any comparison speed tests. I just know that after spending all that time designing and building the darn thing, I can feel the speed difference! [grin]). The tricky part was getting the angles right, as I wanted the front of the box to fit snug against the Linear's seatstays. Those stays don't hang straight down; they start at the outside top edge of the seat, and then angle in towards the chainstays. AND they come back towards the seat a bit. So, that front panel had to be designed first. Then, the one piece that was going to wrap around and form the two sides and back had to be fitted. Only then could I start working out the details for the bottom portion that fit over the rack. That also gave me one of those "DUH!" moments. I was taping everything together to see how it fit, and couldn't understand why one of my measurements was off. In the photos you will notice that the sides actually extend past the seat stays. I wanted to enclose the area between the seat and the box, partly for aerodynamic reasons, and just because it would look better! (This also allows the pressurized bottle for the Air Zound horn to be hidden from harm's way.) When the sides were connected to the rest of the box, I simply had them extending past the seat. I then cut them back, and curved the edges to tuck in behind the seat. There is a bit of space where the seat stay pokes out from the side panel, and on the right side that's where the tube for the hydration bag comes out. The tube then hangs beside the seat, and a little bit of velcro keeps it tucked along side the seat. 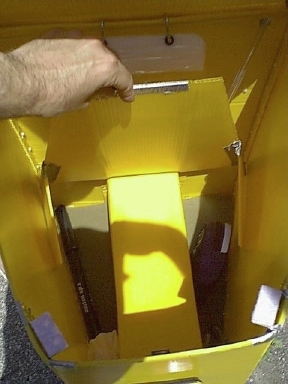 The bottom of the box is held to the rack with velcro, and the front is attached to each seat stay with velcro and two zipties for extra strength. I kept the plastic fender flap that had been keeping spray off the basket, and it sticks out just past the bottom of the box for the same purpose. (In case you're wondering why I didn't just make the end of the box go past the wheel, it's because the bike has to stand on end when not in the house, so a little bit of wheel had to remain sticking out.) The lid is hinged with zipties, and fastens down with velcro mounted to two small L-brackets. bag mounting, and false floor. showing space for pump, tools, etc. If you wish for more details, please feel free to EMAIL me.